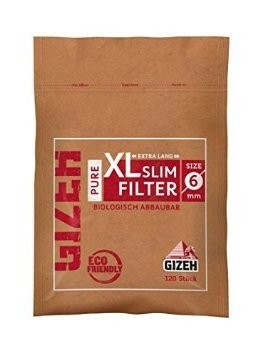 GIZEH PURE XL SLIM FILTERS are made of unbleached cellulose and are biodegradable. They decompose environmentally friendly and natural. The extra long filter saves tobacco and ensures a balanced flavor. Also in the package we have laid on sustainability value: We have the plastic portion is reduced compared to conventional plastic bags by 50%. The empty packaging is completely recyclable.